Yankee Betting Odds Calculator spreadsheets for Horse Racing, Football etc singles, doubles, trebles, accumulators. Simple to use with instant calculations. Ideal for the serious gambler. The Spreadsheets Direct Yankee Odds Calculator allows you to easily calculate potential sports bet winnings. The file allows you enter upto 40 odds in either UK(fractions), European(decimals), American, Hong Kong, Indonesian & Malaysian format. A Yankee bet consists of 4 Selections. 11 bets - 6 doubles, 4 treble, accumulator. The Yankee Odds Calculator allows you to quickly add/remove odds to the Yankee calculation without having to re-type all the odds again. The winnings are automatically calculated in seconds. Each way winnings are also calculated and Place and Losing bets can also be taken into account to give you your actual winnings. 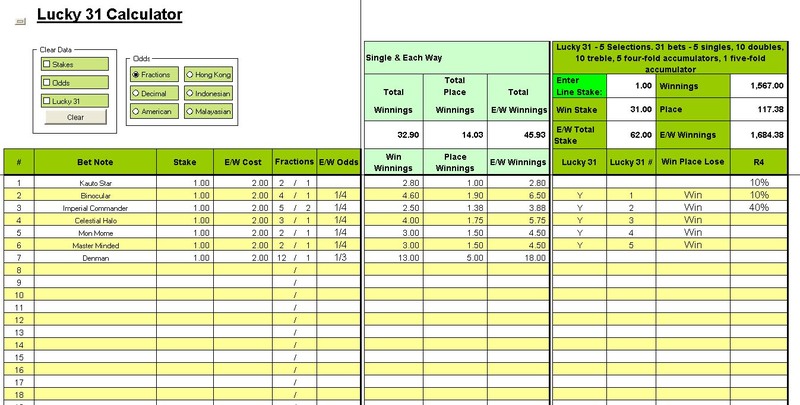 The file will also let you calculate single line bets as well as each way winnings. Files are locked and protected so no formulas are visible. Buy yours today. Once you've paid the download will only take a few minutes.